Study this Dragon1 training course, containing all the required learning materials, for level 3 certification. This training course is provided by the Dragon1 Academy and learns you the basics of the Dragon1 open EA method. The course is provided at request as Business Architecture professional training. There are no pre-requisites for taking this course, although we recommend following the Dragon1 Foundation and Practitioner training course first. Also, you must pass the exam in order to achieve Dragon1 Certification. This training course is about the Dragon1 open EA method and has no dependency towards a software tool. Although optionally a tool can be used during the training course. This course has been fully accredited by the Dragon1 Foundation. 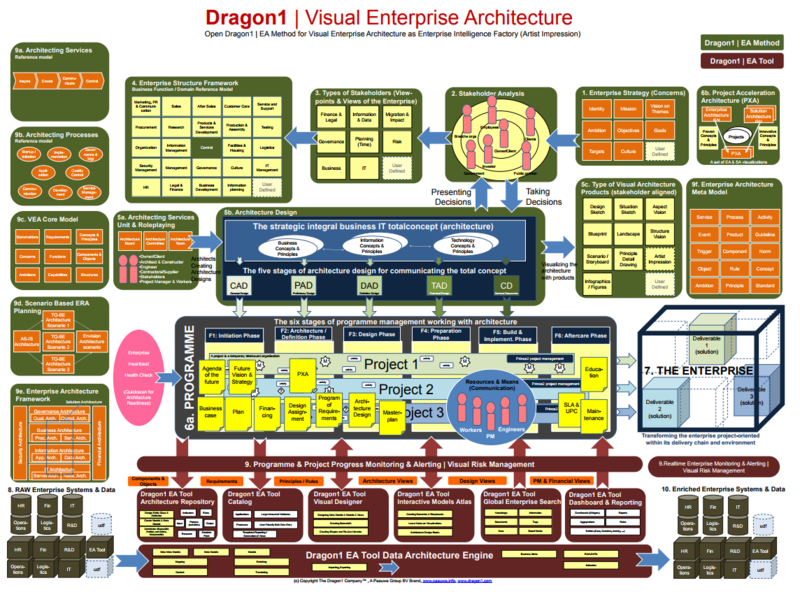 Dragon1 Certified Architects typically implement working with Enterprise Architecture using these visualizations. Become Dragon1 Certified Architect, level 3 by taking a fully accredited class-based or online training course for Dragon1 Professional! Dragon1 Masterclass combines the three training courses. This training course, class-based or an interactive e-learning course is a complete package for those wishing to become Dragon1 Certified. There are no pre-requisites for taking this course, although we recommend following the Dragon1 Foundation and Dragon1 Professional training course. Also, you must pass the exam at both levels in order to achieve Dragon1 Certification. Browse the course syllabus below for a full module by module breakdown of what's included. With this course, you'll receive 12 months access as well as an exam voucher to use within 12 months of courses access. Just contact us when you are ready to sit the exams! Class size is 4 to 8 participants. e-learning start at anytime, anywhere in your web browser and is individual. 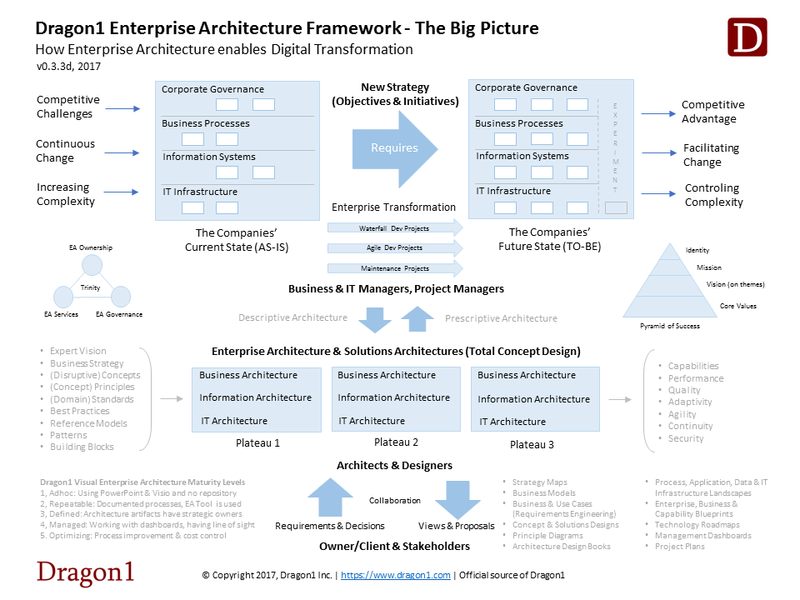 If an organization already has a method, framework, reference architecture and modeling language chosen as internal corporate standard for working with enterprise architecture, we will fit the Dragon1 contents into the internal corporate standard. The Dragon1 Academy offers customized private training solutions to corporate to achieve maximum value for their training funds. We have been helping our clients achieve their private group training objectives since 2005. At the Dragon1 Academy, we offer all the classroom or online courses in a private format - at your facility or ours or online, in any time zone and anywhere in the world. Call The Dragon1 Academy now at +31 317 416 190 or email academy@dragon1.com, to discuss your specific training needs for individuals or groups.